Another day, another left-back linked. Left-back is almost certainly the weak point of Manchester City’s squad, and the fact that some of Europe’s most highly-rated players in that position are being linked with a move to the Etihad is encouraging. Which one (or two?) will it be, though? Danny Rose, Ryan Bertrand, Álex Grimaldo and Juan Bernat are four of the left-backs who have been in the rumour mill of late, but according to reports in Italy, Pep Guardiola’s main target could be a Serie A player. 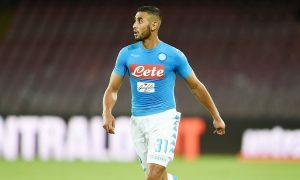 Napoli left-back Faouzi Ghoulam is among the most sought after left-backs who may be available, with both Bayern Munich and Paris Saint-Germain reported to be keen on acquiring the 25-year-old Algerian international. And Ciro Venerable, a Rai Sport transfer market expert in Italy, has told Radio CRC today that Pep Guardiola has jumped into the race with City taking steps in ‘recent hours’ to try and sign the Napoli star. According to Venerable, City are the first club to make a serious approach for Ghoulam. As City found out during the Roberto Mancini era when Edinson Cavani and Ezequiel Lavezzi were targets, Napoli and their eccentric chairman Aurelio De Laurentiis can be hard to deal with. In this case, however, Ghoulam’s contract is running down and he will have just a year remaining on his existing deal next summer. Napoli want the France-born full-back to renew and have offered him €1.8 million per season, less than the €2 million his entourage want. City could meet his wage demands with ease, making him an obtainable target if he is actually a player Pep Guardiola wants. Venerable said Napoli are already looking at possible replacements in fear of losing Ghoulam to a European giant, with Mattia De Sciglio (AC Milan), Matteo Darmian (Manchester United) and Antonio Barreca (Torino) three names they are considering.